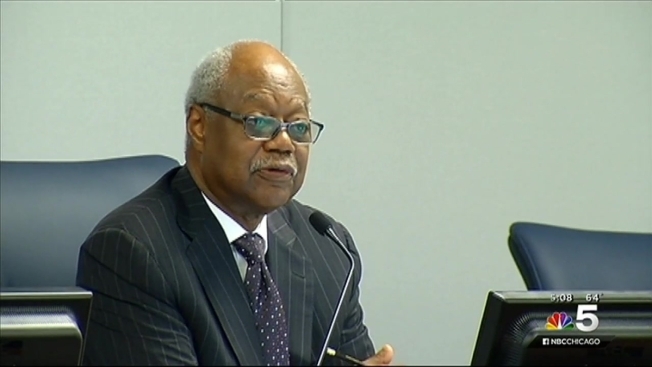 Members of the Chicago Board of Education voted to pass the budget for Fiscal Year 2016 as three different protests took place across the city in opposition to some of the proposed cuts. Hunger strikers gathered outside the Board of Education building on the ninth day of their strike in a bid to save Dyett High School in Bronzeville from closing. One of the strikers, 40-year-old Jeanette Taylor-Ramann, was taken away in an ambulance. Ramann passed out after demanding a decision from the school board on opening Dyett as a green technology academy. Ramann said she and a dozen other parents on the hunger strike have not eaten in more than a week. "I should not be hungry in 2015 over a neighborhood high school that's supposed to belong to the community," Ramann said. 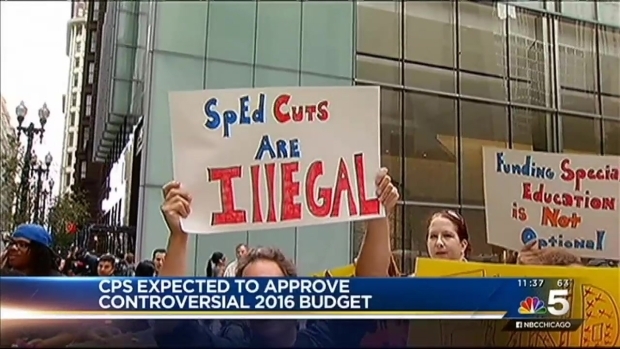 The Chicago Board of Education was expected to approve a controversial budget for Fiscal Year 2016 as some members of the Chicago Teachers Union protested outside CPS headquarters. NBC 5's Kye Martin reports. The Board of Education met to consider the $5.7 billion budget for Chicago Public Schools, but the new board president, who was formally approved at the same meeting, called the proposed budget a short-term solution. The budget calls for $200 million in cuts and approval of more than $1 billion in bonds, after the board agreed to $1.2 billion last month. "This is much like in your personal lives when you begin to have revenue shortfall. You don't have enough income coming in, you start living off your credit cards," Frank Clark, the board president, said. "You can do it short-term, but sooner or later those credit cards max out." The budget also includes a $480 "hole" the district hopes will be filled by the state. Forrest Claypool, CEO of Chicago Public Schools, called for state legislators to "step up and do the right thing when it comes to pensions and education funding." The board unanimously passed the budget over the objections of the Chicago Teachers Union, which also staged protests outside the Bank of America located at 33 N. Dearborn and the CPS headquarters. "We're going to have to keep going to the public with a simple message," said Jesse Sharkey, vice president of CTU. "You're going to have to fund public schools if you'd like to have one. And the fact is we're going to have to raise property taxes. No one will say it, but I will. It's as simple as that." The Dyett supporters did not get the decision they were demanding on Wednesday, but they say they will continue their hunger strike as long as it takes, some of them saying they are willing to die over the issue. At the meeting, Clark and board member Mahalia Hines agreed there needs to be a resolution on Dyett soon, but no decision has yet been made. A public hearing for Dyett is scheduled for Sept. 15.